The Si470x module integrates all functions required for an advanced broadcast FM radio receiver, from antenna input to stereo audio output. •	Worldwide FM band support (76–108 MHz). •	Digital low IF receiver. •	Frequency synthesizer with integrated VCO. •	Automatic frequency control (AFC). •	Automatic gain control (AGC). •	RDS/RBDS decoder (Si4703/05 only). •	Optional digital audio output (Si4705 only). •	Programmable de-emphasis (50/75 μs). •	Programmable reference clock input. 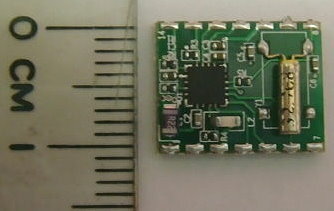 •	2.7 to 5.5 V supply voltage. •	11 x 14 mm module.